We here at Butterworks Farm have long been interested in no grain dairy farming. For the past forty years we have been grain growers as well as hay producers. Cereals (oats, wheat and barley) and row crops like corn and soy have fit neatly into our crop rotation with grasses and legumes. The straw byproduct of the grain is just as important to us for bedding our animals as the grain is for feeding them. We ground the grain into a dairy ration and fed our cows grains from our own farm as opposed to buying it from the “mill”. Over the years, as our soil health and fertility has increased, we have improved the quality of our forages (grass and legumes) to the point where we have been able to reduce the amount of grain fed to our cows to 4 ½ pounds at each milking. Standard fare on most high production dairy farms is one pound of grain for every three pounds of milk produced. Our ratio was closer to 1:5. Early in 2016, we began to conclude that if the quality of our forages was so superior, we could stop feeding grain to our cows without suffering adverse consequences. In early April, we began reducing the amount of grain we fed at each milking. By the end of the month, we were down to less than three pounds per day per cow. On May 1st, we went cold turkey and joined the ranks of 100% grass fed dairy. This was an ideal time to make the transition because the cows had just left their winter quarters and started grazing virgin pasture. 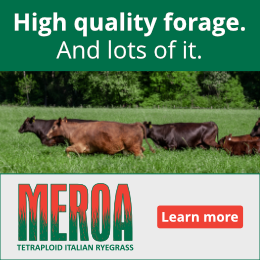 The first growth of grass and legumes is absolutely the best and highest quality forage a dairy farmer will produce during the entire pasture season which lasts until late October. We were quite delighted with our cows’ performance without grain on the new pasture. For the first two weeks, milk production held at 45 pounds per cows. Our initial success was rather short lived, however. By week three, milk production began to drop. Grasses and legumes in the pasture began to lose that first of the season quality as things got coarser and fiber levels began to climb. Daily production dropped to forty pounds and then down into high thirties with the arrival of June. The basic premise of 100% grass fed dairy is that the dry matter from grain has to be replaced with hay and pasture. This is no small task when one considers that nine pounds of grain at 13% moisture is close to eight pounds of dry matter. Consider replacing that eight pounds with forages that have moisture levels of 80 to 90%. It would take close to 100 actual pounds more of hay or pasture to replace the nine pounds of grain that is no longer being fed. Intellectually, we knew that our cows had to consume more forages, but practically we never realized how much more they would need to eat in any given day to replace what was once eaten as a grain ration. As June rolled along and turned into July, we have begun to develop methods to put this heightened forage consumption principle into practice. First and foremost, we have had to increase the size of our grazing paddocks that the cows are given fresh every twelve hours. We have also taken to feeding more stored forages (baleage) in the cow stable during milking time. Cows must have ample feed in front of them at all times whether they are out on grass are tied in a stall to be milked. Until relatively recently, we never realized how much we had been getting out of that nine pounds of grain per day per cow. All in all, we now know that it will take us a lot more land per cow to be 100% grass fed. Long time hay fields will no longer be mowed and will be grazed instead. Our pile of stored feed (fermented wrapped round bales) has begun to dwindle much earlier in the season. All signs point to more, more, more. More feed and much increased labor. One other little nutrition lesson concerns the relationship between protein and energy in our cows’ diet. Protein represents the “grow feeds” and energy represents the “go feeds”. Cows need both in an equal balance. Unfortunately, it is much easier to achieve sustained high protein levels in farm produced forages than it is to consistently produce forage crops that are off the charts in energy. A lot of energy came from the grain that cows once consumed at every milking. If the energy balance is short changed, reproductive performance will drop. Cows need to bred to have a calf once each year in order to remain truly productive and economically viable. The twelve month calving interval is the gold standard in the dairy industry and many grass fed dairies have climbed to a fourteen or fifteen month calving interval. Simply put, it takes longer to get a 100% grass fed cow bred. After hearing what it is like for a well-established successful dairy farm to go the grass fed route, you may be wondering what is in it for us aside from the dubious distinction of fitting into a category that is hot in the consumer world right now. We have given these considerations a fair amount of thought and have decided that our transition to 100% grass fed was well worth it. Despite the fact that we will need more land and sharpened management skills to do this, we are quite happy to promote more grass and less grain (and subsequently tillage) on the land that we steward. More grass means more fibrous root systems in the soil. Less grain means less tillage and better soil health. Our primary goal in the farming we do is to take more carbon dioxide from the atmosphere and through photosynthesis, lock it up in the Earth’s crust as humus and organic matter. Higher carbon levels in the soil are the number one weapon that we as humans have to reduce and eliminate the effects of a changing climate. We are excited to be trying something and challenging and new. Our switch to 100% grass fed dairying is taking us to new levels. It is incredibly hard work, but so much fun and we are learning that we want to share with others in the process. What happened to profitability–it is not a four letter work by the way. More work, more acres required, less milk–doesn’t sound very good to me. Thanks for the candid perspective on your operation and transition. Do you feel the flavor of the milk/milk products changed significantly? Or the nutritional value? Sounds like you were already pretty forage-centric, and somewhat low grain with 9 lbs a day, compared to much dairying (which tends to use both more grain and more corn silage). This is so good to hear, that good pasture and lots of it was and is the answer.